The Omni Group provide some excellent resources to help you get the most out of OmniFocus. OmniFocus is developed, sold, and supported by the Omni Group. This Seattle-based company has been developing productivity software for many years and has a talented team with a passion for producing meticulously crafted apps. Here are some of the resources that the Omni Group provides to help you make productive use of OmniFocus. Help Menu — The Help menu in OmniFocus 3 for Mac is a good place to start. Most notably, selecting OmniFocus Help will open the built-in manual. This is also a convenient place to access OmniFocus News and Release Notes. If you you need some help from the Omni Group’s outstanding “Support Ninjas”, select Contact Omni to drop them a line. 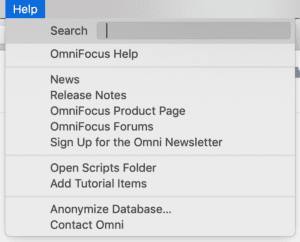 OmniFocus Apps — Download OmniFocus 3 for Mac from the Omni Group’s website or the Mac App Store and put both the Standard and Pro features through their paces. Similarly, the OmniFocus for iOS (that supports iPhone, iPad and Apple Watch) is available through the iOS App Store. Inside OmniFocus — This website is showcases OmniFocus-related workflows and tools and is a natural complement to OmniFocus. The Working With OmniFocus 3 section documents a wide range of OmniFocus workflows. And the Tools & Services area shows how OmniFocus pairs well with other services and tools. OmniFocus Videos — The Omni Group has a large and growing collection of videos that cover features Mac and iOS versions of OmniFocus, stories of OmniFocus in the Field and recordings of talks from past events. OmniFocus Manuals — The Omni Group provides excellent manuals for OmniFocus 3 for Mac and OmniFocus 2 for iOS. Visit the Omni Group’s Manuals page to access the latest version of the manuals for all of the Omni Group’s apps. OmniFocus Support — The Omni Group have a well-deserved reputation for provided excellent support. The OmniFocus Support page contains contact information, support articles and answers to frequently asked questions about OmniFocus. OmniFocus Forum — The Omni Group hosts an active forum for troubleshooting issues and sharing suggestions. Frequent contributors include members of the Omni Group team, including CEO, Ken Case. OmniFocus 3 for Mac Keyboard Shortcuts — To maximize your efficiency, it’s worth spending some time getting to know OmniFocus’ keyboard shortcuts. 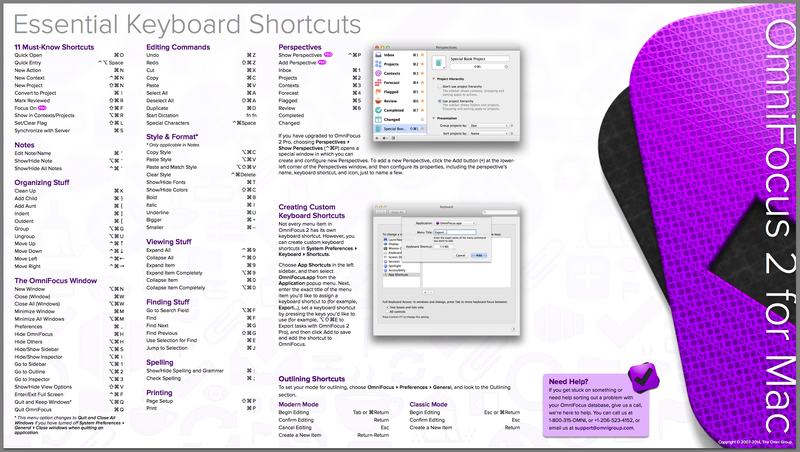 The following graphic (click on it to enlarge) shows the keyboard shortcuts for OmniFocus 2 for Mac. This guide is equally useful in OmniFocus 3 for Mac. Just change “contexts” to “tags” and you’re good to go!